Brahea berlandieri var. bella is a horticultural selection which has at times been assigned species status. 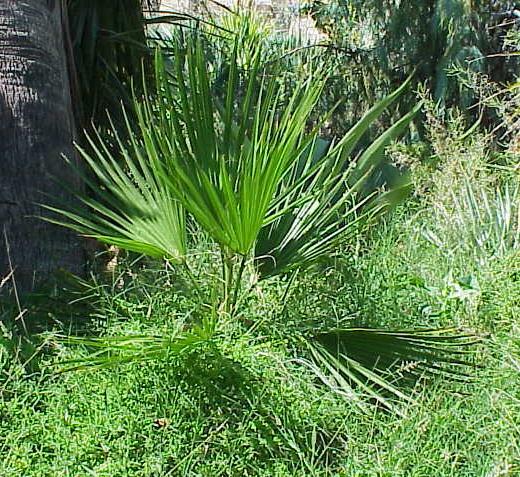 It is only distinguishing characteristic is in having uniformly green leaves in contrast to the silvery-glaucous foliage of Brahea berlandieri. However, as wild collected specimens at the Huntington Garden exhibit identical floral and structural characteristics, Brahea berlandieri var. bella can hardly be considered to be a separate species. In addition, there are mixed populations in Mexico with both "varieties" present. To add to the confusion, both have been considered to be varieties of the widespread Brahea dulcis by some authorities.